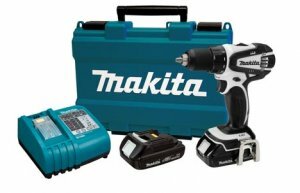 Makita has been an industry leader when it comes to cordless lithium-ion tools, and were the first to come out with the tools we categorize as "Compact". These Compact tools run off of 18 volts of power, but use a smaller battery, and the tools themselves are smaller in size. Makita has announced that they have come out with a new 18-Volt Compact Drill/Driver that is even smaller in size then previous models, by 7/16", and weighs in at only 3.3 lbs. Small and light is good, but according to the specs, the tool is still strong where it counts. The new model LXFD01CW is powered by a Makita-built 2-piece 4-pole motor that uses bigger and stronger front end ball bearings, and a heavy gauge wire for the windings. The new drill uses an all new planetary gear system and a redesigned all metal 2-speed transmission that delivers 480 in.lbs of maximum torque and 290 in.lbs of torque using the PTI testing standards. This is 30 more in.lbs then the previous BDF452HW. Some other notable mentions are the always standard built-in LED task light, and an improved ergonomic design with soft rubberized grip. I should also mention that even though the drill is on the small end, it still features the larger 1/2-inch chuck, something that Makita could have easily dumped to cut down on cost. The LXFD01CW will come in a kit that includes: two 18-volt compact lithium-ion batteries, 15-minute rapid charger, tool belt clip, and case.